Who says round watches can't be interesting? Well, probably pretty much everyone, I bet. After all, round watches do tend to look a lot alike after a while. 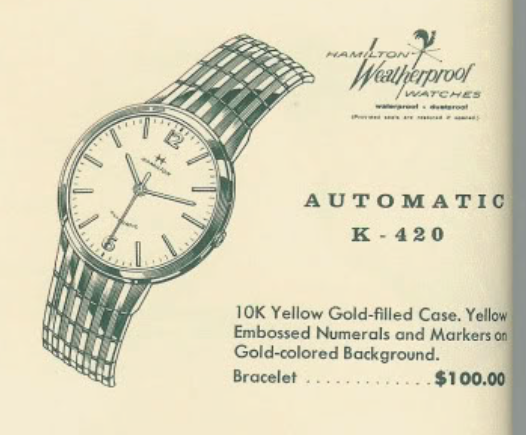 However, Hamilton designers knew that there was a lot that you could do to spice up a watch. The dial, hands, lugs and even the crystal are opportunities to add a little extra flair. 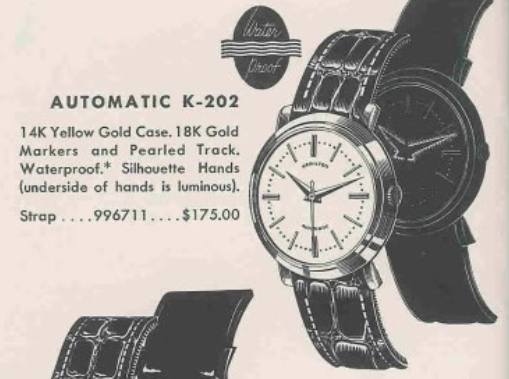 A great example is the 1958 Automatic K-408. It was only produced for two years. 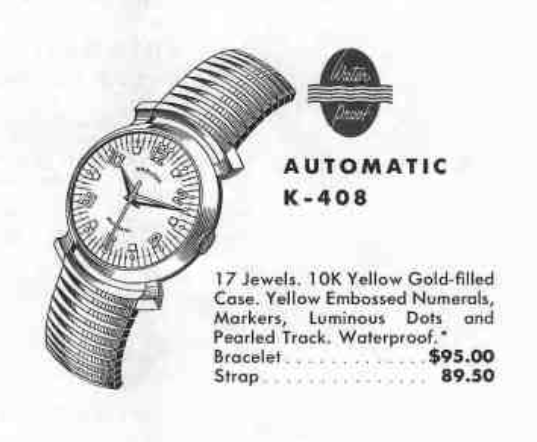 The K-408 came in a 10K yellow gold filled case. 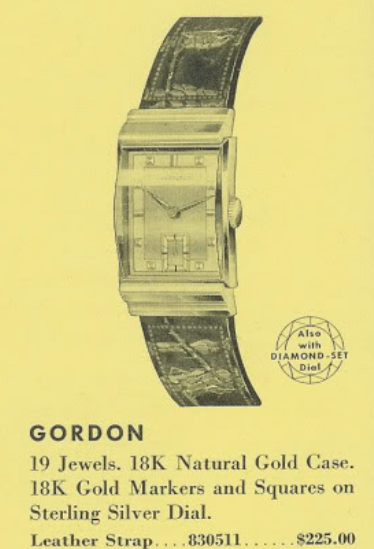 The catalog image shows that the watch had very unique lugs, reminiscent of the Sir Echo introduced in 1957. 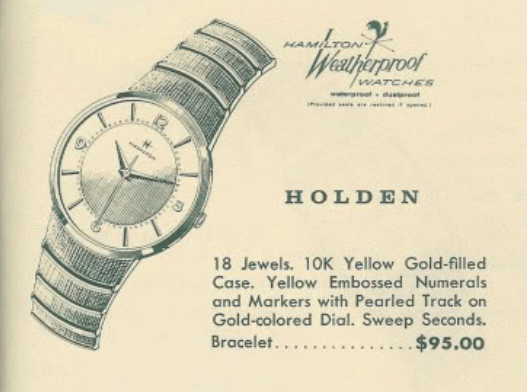 The model was available on a strap or with a bracelet that looks like it integrated flawlessly with the uniquely shaped lugs. What you don't really see on the catalog depiction is the textured dial with a radial finish. With the gold highlights of the numerals and hour markers, the dial seems to sparkle with brilliance. Tucked inside the case is a 17 jewel 661 automatic movement, just as you'd expect for a K-series watch. You don't see the K-408 very often, so when I saw one for sale I made a serious run at it and I had to pay dearly. I was surprised there was as much interest, as it was in rough shape and the case back was dented. As received, it looked promising despite how all the grime and dirt. I crossed my fingers that the case would be okay. I can't think of any reason why the case back would be so dented and I was hoping the case threads would be alright. Fortunately, I couldn't see any issues beyond basic cosmetics. The case opened with ease and the closed tightly. The movement would run and it was largely rust-free so nothing more than a trip to the spa was likely to be needed. Everything is now cleaned and dried. Time for reassembly. The movement is reassembled enough to give the barrel a few winds and make sure everything works. The watch is ticking away with good motion so it's off to the timer. Nothing wrong with this timekeeping. I'll leave it running a little fast while everything settles in. A new crystal is in order since the original was cracked. This watch takes a fairly small crystal, relatively speaking. 26.9mm should do the trick. A fresh brown lizard strap completes the restoration of this uncommon K-408. I put fresh lume on the hands so they're a little brighter than what I started with. This watch is smaller than it's peers in the Automatic K series. I suspect that's one reason why it so much less common. It's not tiny, but it's definitely smaller. I like it though, it's a sharp looking watch... for a round watch. Hamilton had three very small lines of automatics that you don't often see in the wild. There was the Astramatic line, the Kinematic line and the Rotomatic line. All together they sum to seven different models. The rarest of the models are the two Astramatic watches. They are both solid gold, the Astramatic I being 18K and the Astramatic II in 14K. I recently found a Rotomatic I, so I have completed the Rotomatic line and can add it to the Rotomatic II and Rototmatic III. The Rotomatic I was introduced in 1957 and produced for two years. 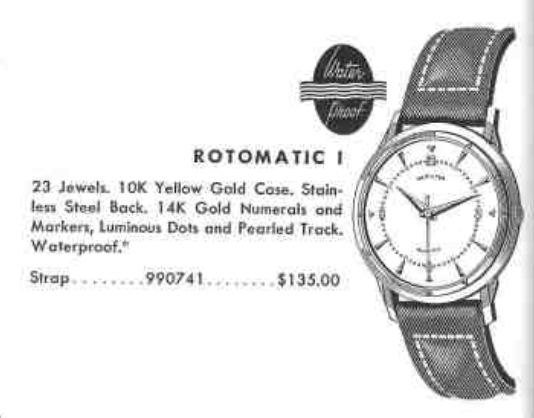 What made the Rotomatic line special was it's 23 jewel automatic movement. 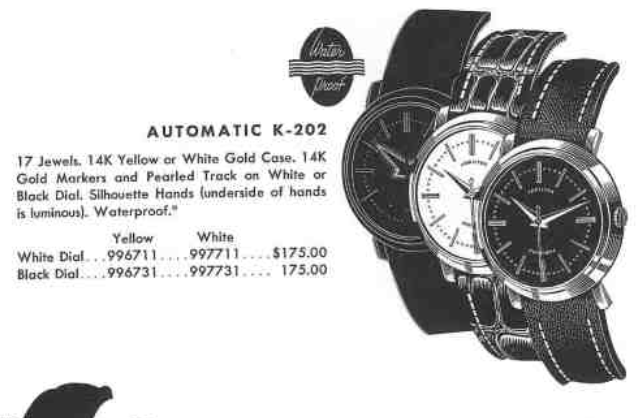 The Astramatic models have 25 jewel grades, by the way. The movement in the Rotomatic models is the Hamilton 665 and it's based largely on the same calibre made by Kurth Freres known as the Hamilton 661. It just has 6 additional jewels. The Rotomatic I is different from the other two Rotomatic models in that it has a solid gold case with a stainless steel back. The others are gold filled. The Rotomatic is interesting in that it has details in the bezel that echo the hour markers on the dial. It's a little extra flair to what is otherwise a fairly vanilla case design. The sterling silver dial has 14K markers and numerals as well as a pearled track and overall it's a very attractive design. I recently purchased a Rotomatic and it's interesting in several ways. First, it's not marked in any way regarding the case material. The seller said it tested to be 14K but according to Hamilton it's 10K gold. It's also a service award watch and factory-engraved so perhaps it's 14K after all? This was a nice watch for the recipient, especially for 15 years of service. Prior to working for Ralston Purina, the recipient served in the US Navy during WWII and was aboard the USS Chicago until it's sinking in 1943 during the Battle of Rennell Island. He retired from the company in 1983... 23 years after receiving this watch. If you look at the photo above and the one below you can see that there are no markings whatsoever that define the case materials. That's pretty odd but not unheard of. The 665 movement is almost identical to the 661. In fact, the only differences that I can see are the six additional jewels where the 661 would have used bushings. With the rotor out of the way you can see four red jewels in the rotor carrier. You won't find those on a 661. The lower pivot of the reversing wheel clutch is also jeweled on the train bridge. That makes five additional jewels. The 6th jewel is inside and supports the 4th wheel. I didn't take a picture of that. There are a lot of parts to a 661 / 665. I think half of them are screws and this watch had a few substitutes from previous watchmakers probably losing one or two of them over the years. Fortunately I have some donors to supply and rectify the situation. Did I say the 665 was basically a 661 with extra jewels? Check out the stamping on the train bridge... "17 Jewels". The movement is now cleaned, oiled and running with excellent motion. The timer says it's running a little slow but that's easy to adjust. Nothing wrong with this performance... right on the money with excellent amplitude and an acceptable beat error. A new crystal is always a great way to spruce up a watch. And here's the finished project, paired with a nice lizard strap. This is a very nice example of a Rotomatic I. You don't see this model often and I feel privileged to have restored it. I bet Harold would have liked to have seen it!